New media companies have been countering traditional broadcast and cable UpFronts with digital content NewFronts to showcase their original program slates to advertisers. AOL upped the ante this year with “AOL Access: A New Kind of NewFront,” held in Manhattan’s South Street Seaport neighborhood. 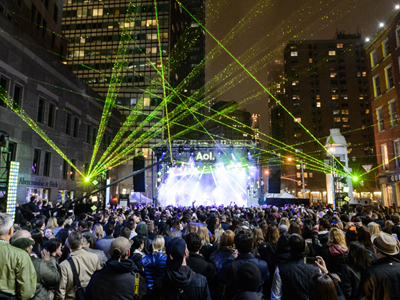 Barkley Kalpak Agency, which produced the AOL event, tasked WorldStage with supplying a massive amount of video, audio and lighting equipment and technical support for the giant interactive block party that spanned a 50,000 square-foot area. The jamboree featured numerous interactive and Virtual Reality exhibits, drones flying through an obstacle course, stage performances by Snoop Dogg and Demi Lovato, and a lightshow. “Having worked with Drew DeCorleto and the WorldStage team on several large-scale NewFronts, I can tell you these are the guys you want to go into battle with!” declares Michael Reese, Executive Vice President, Creative at Barkley Kalpak. Reese explains that various activations at the block party enabled the 3,500 invited guests to experience the AOL brand story in an open platform where they could choose their own adventures. The lightshow served to create a closer connection between the audience and the mobile stage and also helped unify the freeform block party. WorldStage drew from its expertise with big-scale events and its deep and diverse equipment inventory to meet Barkley Kalpak’s needs for the AOL NewFront. The extensive lighting package provided by WorldStage included Martin MAC 301 LED washes and MAC Aura LED washes; VARI*LITE 4000 spots and 2500 spots and washes; Coemar Infinity Wash XLs and ParLite LEDs; Clay Paky Sharpy washes and A.leda B-EYE K20s; Chauvet Nexus 4×4 LED panels and Next NXT-1s; GLP Impression X4S RGBW LED moving heads; Chroma-Q Color Force LEDs; Astera AX7 SpotLite wireless floor spots; Altman Spectra PAR NSP LEDs; Color Kinetics eW Blast Powercore 4000Ks and Color Blast LEDs; Elation EPAR QA LEDs; Kino Flo 4s; and Martin and Elation strobes. WorldStage also provided DF-50 and Ultratec Radiance hazers. grandMA2 full size and Light consoles were on hand for lighting control. Guests were dazzled by a 31×17-foot LED wall created by WorldStage from Unilumin U6 LED V1 tiles. Video content also was displayed on numerous Samsung DM55E 55-inch monitors, NEC 55-inch LEDS, and Sony 46-inch and 60-inch Bravia LEDs located throughout the block party. Content was sourced from Brightsign media players and MacBook Pros running Playback Pro and switched with Barco Folsom systems. The AOL Hub, an area for press, featured a 14×9 foot Unilumen U6 LED wall as well as a 32.2×6.6 foot Unilumen U39 wall, which marked the first time the U39’s have been used. The array of consumer activations required a full complement of audio gear as well. WorldStage covered the Seaport with Shure wireless mics; Apogee AE5 speakers; Meyer UPM-1P, UPM-2P and UPJ-1P speakers; and d&b Q1 speakers and amps and E6 speakers and D12 amps. WorldStage also provided Yamaha DM1000 and LS9-32 digital mixers; Mackie 1402VLZ4 mixers; and Midas Venice 240 16+4 and 160 8+4 mixers.